I am Abdullah Humayun, a first-year MBBS student at RMU. I completed my SSC from Garrison Academy for Boys Lahore and HSSC from Fazaia Inter College, Lahore. To be honest, I had never really thought that I'd be here today, but Alhamdulillah, credit goes to my parents and teachers. They had a firm belief right from the start that I'd go on to do something great one day. Although I am not there yet I hope to be IA in coming years. My father is from Pak Army so I had the privilege of studying from different teachers in different schools with different class fellows. I think this experience of diversity really shaped me as who I am and made me a better person. About my upbringing, I'd like to praise both my father and my mother. My father despite being a high ranking officer never spoiled me with unnecessary "laad aur pyar" as we call it. He cultivated a habit of reading in us and he taught us the value of things. TopStudyWorld: What does RMU make different than other medical colleges in Pakistan? With no disrespect to other respected institutes, I think RMU (RMC) has an edge because its current VC is a former alumnus and he is working day and night to improve standards here. From 2017-18 Module System will be implemented which I think does not exist in any other govt college. Once a year RMU conducts a scientific conference which is attended by Rawalians working in different parts of the world. It's a great exposure to undergraduate students. RMU has the highest number of allotted seats for foreign/tribal students so again the diversity here is an edge. TopStudyWorld: You studied from Federal Board, so what do you suggest which board students should follow for the success in MDCAT, Punjab or Federal? Because FBISE has changed many books which are much different than Punjab Board. I think this I cannot answer this question as a yes/no question. The choice of a board should be made very carefully considering your upbringing, convenience, mental thinking etc. Federal board pays special emphasis on thorough study and critical evaluation. But its marking thresholds are lower than the other boards. So you get a better standard of education but on the paper lower grades. It's up to you to decide which is important. I'd always pick FBISE because I have never been fond of shortcuts. TopStudyWorld: How did you manage college and academy at the same time? Wasn't it an enigma? I'd like to add up to my first answer here. I was an active student till F.Sc. Captain of the football team, a member of school's student council, captain of a quiz team. I joined kips in 9th,10th for short period of time. In my view, till matric, you can manage things easily. But in F.Sc, I had to give up on my hobbies. I missed a cousin's wedding because I was in kips taking an FLP. I can't describe how difficult it was attending college and academy both but then again success never comes through shortcuts you have to exert yourself, step out of your comfort zone. Alhamdulillah now in medical college again I am able to continue my hobbies side by side with studies. TopStudyWorld: Do you think Academy plays an important role? Tips for students who can't afford? When did you start preparation for MDCAT, and how many months did it take to complete? Yes, KIPS played a very important role for me. The teachers there are my role models. They cultivated my strengths and trimmed down weaknesses. Use the internet positively. Yes, you have to work a bit more hard to compete with your fellows who attend academies but it's not very difficult if you are determined to prove yourself. I joined kips right after my HSSC exam ended, a 3 month-long session. I was very regular. No absentees. TopStudyWorld: What do you suggest to the students who can't afford Academy for entry test preparation? Which books do you prefer for Entry Test Preparation other than textbooks? Cultivate a strong sense of self worth. Don't fall prey to inferiority complex. Through the internet everything is accessible. Use it wisely and to your advantage. Even kips tests with keys are posted on Facebook groups. Khan Academy is a great online help. You can do it all it takes is a desire to succeed. But I'd like to add those who can't afford academies you can make up for it in several ways. Ask your friends regularly about what they are learning in the academy and how. I think textbooks are sufficient. I brought Redspot Series but I never really used them. The Kips Collection plus Textbooks were enough for me. TopStudyWorld: What did you do before the Entry Test day? How many hours did you sleep? Do you think sleeping makes a major difference in studies? I didn't open my books before the exam day. I slept at 9 or maybe 10. Woke up at fajr. Recited Quran prayed to Allah. Yes, sleep makes a major difference. You can't and should not attempt to revise whole course in one day. Just do some selected things. Relax and be happy that you gave it your best shot. TopStudyWorld: How do you memorize effectively so that you don't forget during the F.Sc exams and Entry Tests separately? Do you revise daily or weekly or monthly? What are your smart ways? My smartest technique is to be vigilant during lectures both in college as well as the academy. I was a front row student that made a huge difference because a lot of times while attempting MCAT or F.Sc exams I could not recall studying that particular thing but I could recall my teacher's words. Another strategy that helped me was that I worked slowly and steadily throughout the year rather than working fervently during last days. I think it's easy to retain something that you have learned gradually and not in a hurry. Finally, I used to make notes, write things down and sometimes teach my class fellows. That really helps. I revised weekly if not daily (F.Sc) and daily in MCAT preparation. TopStudyWorld: How did you control yourself during the MDCAT Entry Test? Even brilliant students become nervous during the test, and get low marks? Pressure management. I had this belief that I gave it my all result isn't in my hand. I think that calmed me down and I performed at my optimum level. You should have a strong belief in Allah and His scheme in that way you won't get distracted by uncertain thoughts. It is very important to calm yourself up because during MDCAT all sorts of mistakes are caused by a confused state of mind. I recited Darood Shareef and asked my parents to pray before going for MCAT. That helped. TopStudyWorld: You got great marks in FBISE F.Sc exam, what were the things that made such marks possible? Hard work over a period of time and sacrifice. Respecting your parents and teachers. Summary of my success in F.Sc. If you find yourself with ample free time during F.Sc. you are going in a wrong way. I think it's all about who wants it more. You have to prove that your desire of success is greater than others. I sacrificed a lot in F.Sc years. and prayers are very important. Don't think you can excel by studying in last three months and partying before. in 90 percent of cases, you will have to pay for this approach. Be slow but steady and consistent. TopStudyWorld: Is it important to follow the FBISE lines rule to write answer 3 to 4 lines in English, Urdu and other science subjects? No, it isn't. you can write answers but they should not exceed half a page in science subjects and English and 5 lines in Urdu. In Urdu short answers are important for managing time so if you are writing long answers you are only harming yourself. TopStudyWorld: How did you keep yourself motivated towards your goals? Yes, there are times when you feel like quitting. I once came from KIPS during MCAT preprepation and cried for half an hour in my mother's lap. She just sat silently listening to me and just one sentence from her was enough "Abdullah mjhy pura yaqeen hai tm kamyab hogy" It's okay to feel rejections, fears, insecurities at times. We are human; it's natural. She just sat silently listening to me and just one sentence from her was enough "Abdullah mjhy pura yaqeen hai tm kamyab hogy" It's okay to feel rejections, fears, insecurities at times. What kept me going and still motivates me is the wish to make my parents proud. They have given me their youth, their time, sacrificed their interests for my sake. The happy tears and smile on their faces when I sent them my first picture in white coat. That memory keeps me going on. In fact I am in tears right now as I recall it. Another factor is the wish to bring good name for Pakistan. I read about all the developments taking place in the world and it motivates me that IA one day I will play a role in bringing these developments here. TopStudyWorld: The last message to the students who are preparing for F.Sc exams and entry tests? Be humble, be respectful, be honest. Do not cheat even if it is a single MCQ. Collect prayers from parents teachers friends neighbors relatives or from everywhere. Respect everyone irrespective of social stature. Help people even if it means sacrificing your time. Please take out time to observe how your parents work hard for you. Don't let their hardwork go down the drain. Maintain a close relationship with Allah. Cultivate a habit of reading. Be aware of the world and the changes taking place. Adopt a learning attitude. Learn even from your foes.Be grateful, be expressive. Never feel shy to express yourself never feel shy to commit a mistake. Work hard I assure you it will be worth it. 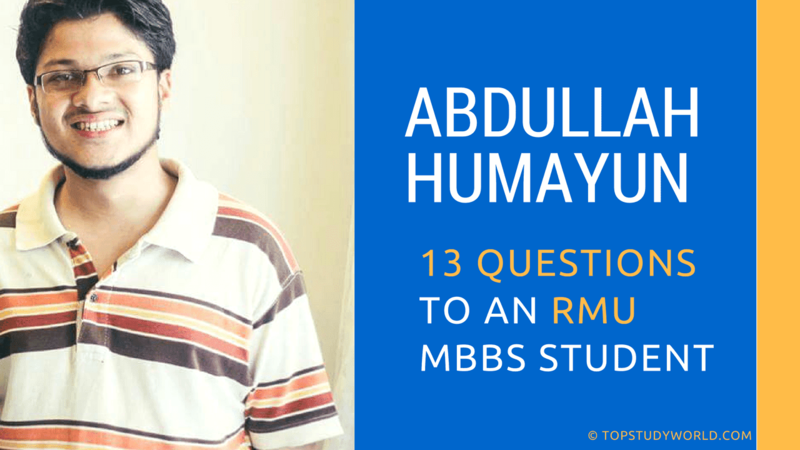 Here is the interview of Abdullah Humayun, an MBBS student at RMU. Questions are related to F.Sc and MDCAT.